The satellite photo above shows what the trees edging Mossgrove Park looked like a little more than a month ago. The bottom photo shows what happened after the city responded to some complaints that kids were 'hanging out' in the park after dark. Let's think about that... kids were hanging out in the park—after dark. I guess that means the residents of Riverdale where I live should prepare themselves for a wholesale decimation of the trees in WIthrow Park. Let's not stop there. High Park has to be next. Toronto's ravines? Why not! Police spokesman said that they asked the city to cut off the trees' lower branches. The city's Parks Department missed the memo. Sometimes I worry that we are becoming a society that can no longer tolerate differences and any amount of uncertainty. Let's face it, there are always people whose choices in life are driven by fear. If the majority of us accept that condition, just turn off the lights of our culture and lock the door, because the forces of fear will turn us into a country few, if any will want to be part of. 'Blu' offers up a recent graffiti animation from the streets of Buenos Aires. Watch it and you will not believe what the artists accomplished. One questions though—how long did it take? The Aral Sea, 2006. Now one-half its original size and hopelessly polluted. Given that Canada is the land of glacier-fed streams, and (relatively) clean water, it is hard to imagine the Great Lakes being great no more—but it is possible. 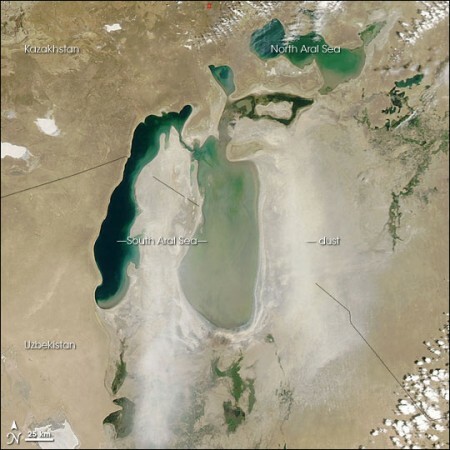 Just take a look at the Aral Sea in Kazakhstan and Uzbekistan for an example of what havoc exploitative policies can cause on a seemingly robust ecosystem. We tend to think such savage exploitation will never happen here, but we also thought the Cod Fishery would go on forever, and Passenger pigeons were so plentiful that we could kill them at our pleasure. The truth is, we are opportunistic creatures who can rationalize just about any travesty as long as there is a short-term dollar to be had, or an economic advantage to be gained. To compound a bad situation, when it comes to the environment time is our enemy, and not for the obvious reasons. No, time lets us forget what once was. Like the proverbial frog in a slowly warming pan of water, our condition is always relative to what we remember with accuracy. SInce most of us seem to suffer from advanced Alzheimer's when it comes to remembering the natural environment, will that be frog's legs anyone? 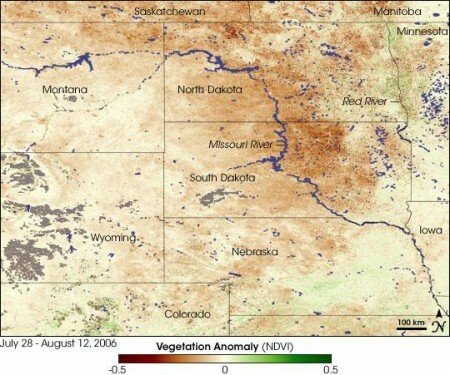 Vegetation was faring worst along the Missouri River through North and South Dakota, but below-average vegetation conditions stretch across parts of Montana, Wyoming, Colorado, northwestern Nebraska, and Minnesota as well. The plains of Canada’s Saskatchewan and Manitoba provinces were suffering drought, too. The drought of 2006 swept across North America's Great Plains sucking water from the soil and threatening to bring back the "dirty thirties" or worse to the world's supposed bread basket (or is that now the world's ethanol tank). Just take a look at the map above. Turns out the Wisconsin borders Lake Superior and Lake Michigan. Guess what state was unable to ratify the Great Lakes Compact. You guessed it. With all that water just sitting there, why should neighbouring farmlands have to go without? You can hear the trumpeting now. "This is a national emergency." "We must have the water for short-term relief." "The have states must share with the have nots." I have no doubt that's what the bureaucrats managing the Aral Sea once said. But since they are all dead now, who is to know—or care? It is history, just like the Cod. The Albany Club is one of Canada’s oldest private clubs. Founded in 1882 and named after the Duke of Albany, the Club has occupied its current location for more than 125 years. The Club’s history is reflected not just in its building and archives, but in many events. The contributions of past and current members starting with founding member Sir John A. Macdonald and including each subsequent Conservative Prime Minister are celebrated within the walls of the Club. The club's building has faded into the aging fabric that is the legacy of 19th Century Toronto. I doubt if many people even notice it when walking or driving by. The structure was built in 1840 by local architect John G. Howard. Over time it has changed from its original Georgian Style to the Empire Style it now exhibits.